Not to be confused with Electroencephalography (EEG), Electrocardiography (ECG), Electronystagmography (ENG), Electrooculography (EOG), and Electromyography (EMG). Polysomnography (PSG), a type of sleep study, is a multi-parametric test used in the study of sleep and as a diagnostic tool in sleep medicine. The test result is called a polysomnogram, also abbreviated PSG. The name is derived from Greek and Latin roots: the Greek πολύς (polus for "many, much", indicating many channels), the Latin somnus ("sleep"), and the Greek γράφειν (graphein, "to write"). Type I Polysomnography, a sleep study performed overnight while being continuously monitored by a credentialed technologist, is a comprehensive recording of the biophysiological changes that occur during sleep. It is usually performed at night, when most people sleep, though some labs can accommodate shift workers and people with circadian rhythm sleep disorders and do the test at other times of the day. The PSG monitors many body functions, including brain activity (EEG), eye movements (EOG), muscle activity or skeletal muscle activation (EMG), and heart rhythm (ECG), during sleep. After the identification of the sleep disorder sleep apnea in the 1970s, the breathing functions, respiratory airflow, and respiratory effort indicators were added along with peripheral pulse oximetry. Limited channel Polysomnography, or unattended home sleep tests, should be referenced as Type II - IV channel Polysomnography. With some controversy, Polysomnography is best performed by technicians and technologists, specifically licensed and credentialed in Sleep Medicine, having superior training and knowledge in sleep, but at times inferior Credentials, (nurses and respiratory therapists), are allowed to perform this sophisticated work despite lack of knowledge and training. Polysomnography no longer includes NPT, Nocturnal Penile Tumescence, for monitoring of erectile dysfunction. It is reported that all Male patients will experience erections during phasic REM sleep, regardless of dream content. Polysomnography is used to diagnose, or rule out, many types of sleep disorders, including narcolepsy, idiopathic hypersomnia, periodic limb movement disorder (PLMD), REM behavior disorder, parasomnias, and sleep apnea. Although it is not directly useful in diagnosing circadian rhythm sleep disorders, it may be used to rule out other sleep disorders. The use of Polysomnography as a screening test for persons having excessive daytime sleepiness as a sole presenting complaint is controversial. 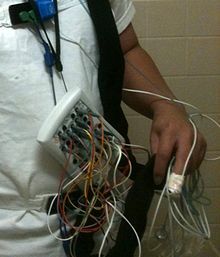 A polysomnogram will typically record a minimum of 12 channels requiring a minimum of 22 wire attachments to the patient. These channels vary in every lab and may be adapted to meet the doctor's requests. 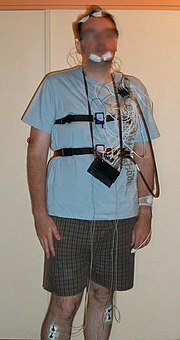 There is a minimum of three channels for the EEG, one or two measure airflow, one or two are for chin muscle tone, one or more for leg movements, two for eye movements (EOG), one or two for heart rate and rhythm, one for oxygen saturation, and one each for the belts, which measure chest wall movement and upper abdominal wall movement. The movement of the belts is typically measured with piezoelectric sensors or respiratory inductance plethysmography. This movement is equated to effort and produces a low-frequency sinusoidal waveform as the patient inhales and exhales. Because movement is equated to effort, this system of measurement can produce false positives. It is possible, especially during obstructive apneas, for effort to be made without measurable movement. 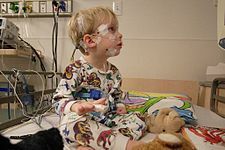 The electroencephalogram (EEG) will generally use six "exploring" electrodes and two "reference" electrodes, unless a seizure disorder is suspected, in which case more electrodes will be applied to document the appearance of seizure activity. The exploring electrodes are usually attached to the scalp near the frontal, central (top) and occipital (back) portions of the brain via a paste that will conduct electrical signals originating from the neurons of the cortex. These electrodes will provide a readout of the brain activity that can be "scored" into different stages of sleep (N1, N2, and N3 - which combined are referred to as NREM sleep - and Stage R, which is rapid eye movement sleep, or REM, and Wakefulness). The EEG electrodes are placed according to the International 10-20 system. The electromyogram (EMG) typically uses four electrodes to measure muscle tension in the body as well as to monitor for an excessive amount of leg movements during sleep (which may be indicative of periodic limb movement disorder, PLMD). Two leads are placed on the chin with one above the jawline and one below. This, like the EOG, helps determine when sleep occurs as well as REM sleep. Sleep generally includes relaxation and so a marked decrease in muscle tension occurs. A further decrease in skeletal muscle tension occurs in REM sleep. A person becomes partially paralyzed to make acting out of dreams impossible, although people that do not have this paralysis can suffer from REM behavior disorder. Finally, two more leads are placed on the anterior tibialis of each leg to measure leg movements. Though a typical electrocardiogram (ECG or EKG) would use ten electrodes, only two or three are used for a polysomnogram. They can either be placed under the collarbone on each side of the chest or one under the collarbone and the other six inches above the waist on either side of the body. These electrodes measure the electrical activity of the heart as it contracts and expands, recording such features as the "P" wave, "QRS" complex, and "T" wave. These can be analyzed for any abnormalities that might be indicative of an underlying heart pathology. Pulse oximetry determines changes in blood oxygen levels that often occur with sleep apnea and other respiratory problems. The pulse oximeter fits over a fingertip or an earlobe. Snoring may be recorded with a sound probe over the neck, though more commonly the sleep technician will just note snoring as "mild", "moderate" or "loud" or give a numerical estimate on a scale of 1 to 10. Also, snoring indicates airflow and can be used during hypopneas to determine whether the hypopnea may be an obstructive apnea. For the standard test, the patient comes to a sleep lab in the early evening and over the next 1–2 hours is introduced to the setting and "wired up" so that multiple channels of data can be recorded when he/she falls asleep. The sleep lab may be in a hospital, a free-standing medical office, or in a hotel. A sleep technician should always be in attendance and is responsible for attaching the electrodes to the patient and monitoring the patient during the study. During the study, the technician observes sleep activity by looking at the video monitor and the computer screen that displays all the data second by second. In most labs, the test is completed and the patient is discharged home by 7 a.m. unless a Multiple Sleep Latency Test (MSLT) is to be done during the day to test for excessive daytime sleepiness. Most recently, health care providers may prescribe home studies to enhance patient comfort and reduce expense. The patient is given instructions after a screening tool is used, uses the equipment at home and returns it the next day. Most screening tools consist of an airflow measuring device (thermistor) and a blood oxygen monitoring device (pulse oximeter). The patient would sleep with the screening device for one to several days, then return the device to the health care provider. The provider would retrieve data from the device and could make assumptions based on the information given. For example, series of drastic blood oxygen desaturations during night periods may indicate some form of respiratory event (apnea). The equipment monitors, at a minimum, oxygen saturation. More sophisticated home study devices have most of the monitoring capability of their sleep lab technician run counterparts, and can be complex and time-consuming to set up for self-monitoring. After the test is completed a "scorer" analyzes the data by reviewing the study in 30-second "epochs". Sleep stages: these are based on 3 sources of data coming from 7 channels: EEG (usually 4 channels), EOG (2), and chin EMG (1). From this information, each 30-second epoch is scored as "awake" or one of 4 sleep stages: 1, 2, 3, and REM, or Rapid Eye Movement, sleep. Stages 1–3 are together called non-REM sleep. Non-REM sleep is distinguished from REM sleep, which is altogether different. Within non-REM sleep, stage 3 is called "slow wave" sleep because of the relatively wide brain waves compared to other stages; another name for stage 3 is "deep sleep". By contrast, stages 1 and 2 are "light sleep". The figures show stage 3 sleep and REM sleep; each figure is a 30-second epoch from an overnight PSG. "Arousals" are sudden shifts in brain wave activity. They may be caused by numerous factors, including breathing abnormalities, leg movements, environmental noises, etc. An abnormal number of arousals indicates "interrupted sleep" and may explain a person's daytime symptoms of fatigue and/or sleepiness. Once interpreted, the sleep physician writes a report that is sent to the referring provider, usually with specific recommendations based on the test results. The below example report describes a patient's situation, the results of some tests and mentions CPAP as a treatment for obstructive sleep apnea. CPAP is continuous positive airway pressure and is delivered via a mask to the patient's nose or the patient's nose and mouth. (Some masks cover one, some both). CPAP is typically prescribed after the diagnosis of OSA is made from a sleep study (i.e., after a PSG test). To determine the correct amount of pressure and the right mask type and size, and also to make sure the patient can tolerate this therapy, a "CPAP titration study" is recommended. This is the same as a "PSG" but with the addition of the mask applied so the technician can increase the airway pressure inside the mask as needed, until all, or most, of the patient's airway obstructions are eliminated. Mr. J----, age 41, 5′8″ tall, 265 lbs., came to the sleep lab to rule out obstructive sleep apnea. He complains of some snoring and daytime sleepiness. His score on the Epworth Sleepiness Scale is elevated at 15 (out of possible 24 points), affirming excessive daytime sleepiness (normal is <10/24). This single-night diagnostic sleep study shows evidence for obstructive sleep apnea (OSA). For the full night his apnea+hypopnea index was elevated at 18.1 events/hr. (normal <5 events/hr; this is "moderate" OSA). While sleeping supine, his AHI was twice that, at 37.1 events/hr. He also had some oxygen desaturation; for 11% of sleep time his SaO2 was between 80% and 90%. Results of this study indicate Mr. J---- would benefit from CPAP. To this end, I recommend that he return to the lab for a CPAP titration study. This report recommends that Mr. J---- return for a CPAP titration study, which means a return to the lab for a second all-night PSG (this one with the mask applied). Often, however, when a patient manifests OSA in the first 2 or 3 hours of the initial PSG, the technician will interrupt the study and apply the mask right then and there; the patient is awakened and fitted for a mask. The rest of the sleep study is then a "CPAP titration." When both the diagnostic PSG and a CPAP titration are done the same night, the entire study is called "split night". It is "half as expensive" to whoever is paying for the study. There is less time to assure an adequate CPAP titration. If the titration begins with only a few hours of sleep left, the remaining time may not assure a proper CPAP titration, and the patient may still have to return to the lab. Mr. B____, age 38, 6 ft. tall, 348 lbs., came to the Hospital Sleep Lab to diagnose or rule out obstructive sleep apnea. 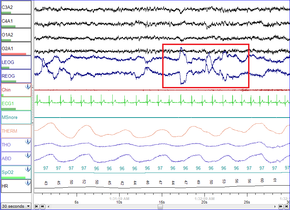 This polysomnogram consisted of overnight recording of left and right EOG, submental EMG, left and right anterior EMG, central and occipital EEG, EKG, airflow measurement, respiratory effort and pulse oximetry. The test was done without supplemental oxygen. His latency to sleep onset was slightly prolonged at 28.5 minutes. Sleep efficiency was normal at 89.3% (413.5 minutes sleep time out of 463 minutes in bed). During the first 71 minutes of sleep Mr. B____ manifested 83 obstructive apneas, 3 central apneas, 1 mixed apnea and 28 hypopneas, for an elevated apnea+hypopnea index (AHI) of 97 events/hr (*"severe" OSA). His lowest SaO2 during the pre-CPAP period was 72%. CPAP was then applied at 5 cm H2O, and sequentially titrated to a final pressure of 17 cm H2O. At this pressure his AHI was 4 events/hr. and the low SaO2 had increased to 89%. This final titration level occurred while he was in REM sleep. Mask used was a Respironics Classic nasal (medium-size). In summary, this split night study shows severe OSA in the pre-CPAP period, with definite improvement on high levels of CPAP. At 17 cm H2O his AHI was normal at 4 events/hr. and low SaO2 was 89%. Based on this split night study I recommend he start on nasal CPAP 17 cm H2O along with heated humidity. ^ Ibáñez, Vanessa; Silva, Josep; Cauli, Omar (2018-05-25). "A survey on sleep assessment methods". PeerJ. 6: e4849. doi:10.7717/peerj.4849. ISSN 2167-8359. PMC 5971842. PMID 29844990. Lerman, SE; Eskin, E; Flower, DJ; George, EC; Gerson, B; Hartenbaum, N; Hursh, SR; Moore-Ede, M; American College of Occupational and Environmental Medicine Presidential Task Force on Fatigue Risk Management (Feb 2012). "Fatigue risk management in the workplace". Journal of Occupational and Environmental Medicine. 54 (2): 231–58. doi:10.1097/JOM.0b013e318247a3b0. PMID 22269988. Pressman MR (2002). Primer of Polysomnogram Interpretation. Boston: Butterworth Heinemann. ISBN 978-0-7506-9782-8. Berry RB (2003). Sleep Medicine Pearls. Philadelphia: Hanley & Belfus. ISBN 978-1-56053-490-7. Bowman TJ (2003). Review of Sleep Medicine. Boston: Butterworth Heinemann. ISBN 978-0-7506-7392-1. Kushida CA, Littner MR, Morgenthaler TM, et al. (2005). "Practice parameters for the indications for polysomnography and related procedures: An update for 2005". Sleep. 28 (4): 499–519. doi:10.1093/sleep/28.4.499. PMID 16171294.